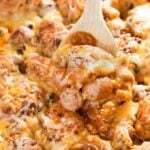 Chili Dog Biscuit Casserole – The American classic chili cheese dog turned into an easy weeknight casserole! This dish is full of flavor and makes a fun dinner the whole family will love. Does it get any more classic than a hot dog loaded up with warm chili and melty cheese? I think not. Pretty sure my kids could live off of the things. I have one child that is ALL about hot dogs all the time and would prefer to just eat them raw out of the package (no thanks, dude). The other kiddo doesn’t even think about putting a hot dog in her pie hole unless it’s a chili dog! Me, I can do a hot dog, just not very often. But, I can do this chili dog casserole every single day of my cheese loving life if you’d let me. While I always like to keep my posts light and happy around here, I do want to touch base with you guys on a more personal level. If you follow me on Instagram and my story there, you’ll already know why I was away from my blog last week. I was still cooking, I just found it difficult to make a post, and I wanted to share why. This recipe was made last week because some comfort food was much needed. A bout a week ago, we lost a dear family member. My cousin, Shawn. His story is a long one, as he was a childhood cancer survivor. He lived with brain damage the majority of his life. BUT, he LIVED. He wasn’t supposed to, but he defeated the odds at an early age and lived to be 39 years old. Shawn was by far the most precious person to ever have existed. A truly innocent, loving, kind, soul. He was loved by everyone. He is missed by everyone. Thanks to my readers for bearing with me while I was away from the blog last week. We’re back up and running this week and this comfort food dinner seemed like a good place to start! If it’s too hot in your neck of the woods to heat up your oven but you still want some cheesy chili comfort food, be sure to check out my Crockpot Frito Chili Pie. Preheat oven to 375 degrees. Grease a 9x13 inch baking dish lightly with oil or non stick cooking spray, set aside. Open the biscuits. Cut each biscuit into quarters and place into a large bowl. Add the sliced hot dogs, chili, and 1 1/2 cups of the cheese to the biscuits in the bowl, stir very well to combine. Pour mixture into prepared baking dish, and cover with foil. Bake in preheated oven for 25 minutes. Take the casserole out of the oven and discard the foil. Top with remaining 1/2 Cup of cheese. Bake uncovered for an additional 20 minutes, until biscuits are cooked through. 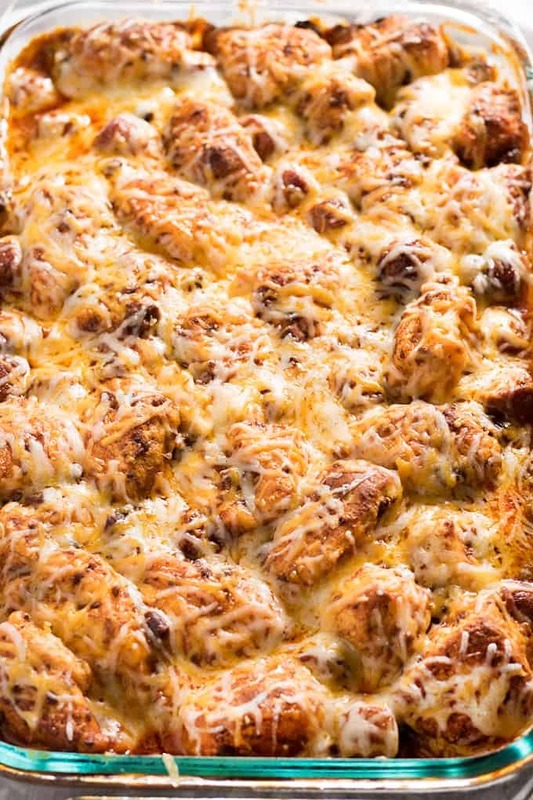 NOTE: I like to use a triple cheddar blend for the cheese in this recipe. Any cheese you like best will work! NOTE: This is also great with minced onions added in before cooking. This recipe was shared over at The Weekend Potluck! 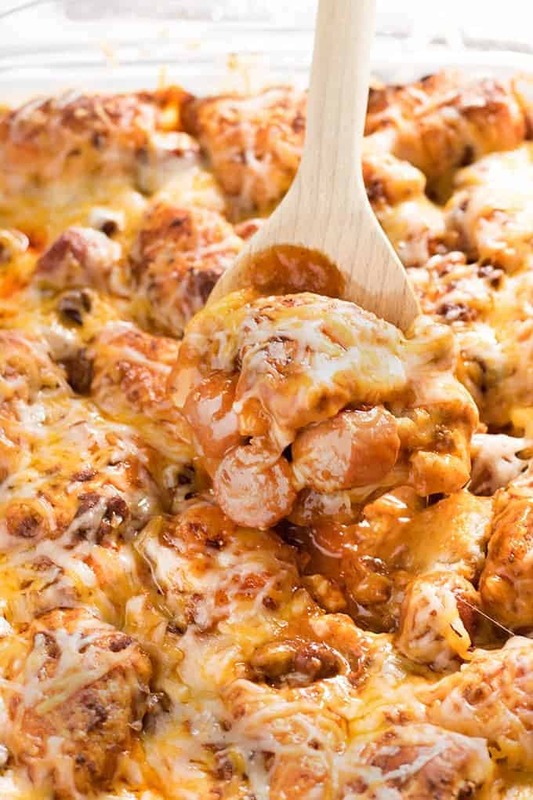 Chili Dog Biscuit Casserole: This Chili Dog Casserole is a quick and easy weeknight dinner recipe filled with biscuits, chili, hot dogs, and cheese! 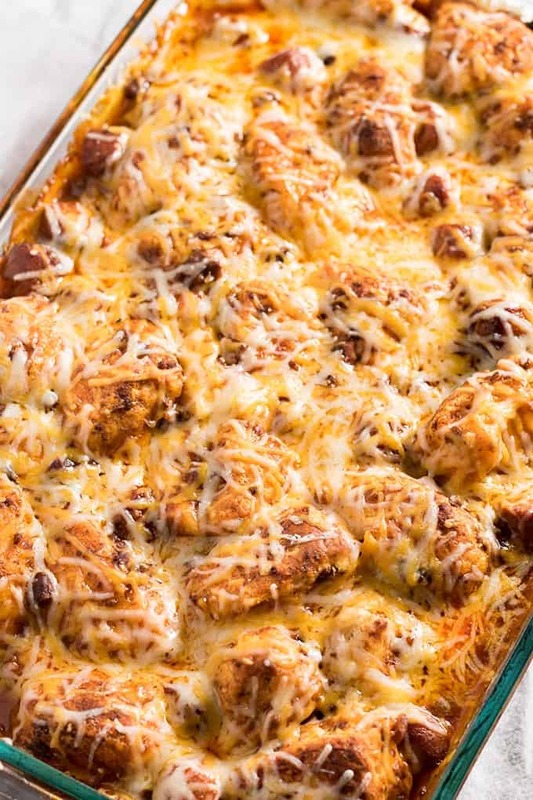 A delicious comfort food dinner recipe that is perfect for the whole family. This is really good! I was pleasantly surprised. I like chili dogs, so this is a neat alternative. I’ve made it several times since I came across this recipe, and it’s been a hit each time. It even reheats pretty good in the microwave when I’ve taken the leftovers to work. I use Bryan chili with beans, and those Bar S jumbo brown hotdogs. My husband and sons are on their way back from a camping/hiking weekend, so I just put this in the oven for them to eat when they get here. I’m sure it isn’t the healthiest, but you aren’t going for healthy with this dish, you are getting tasty and hearty. Put a salad with it if it makes you feel better haha! Very tasty. I made this tonight but substituted the canned chili with my homemade chili. Added 3 strips of thick cut bacon diced up really well into the chili. I made this dish tonight still in oven. I’ll try that for sure – thanks! I tried this recipe with the ingredients I had on hand…hotdogs, cheese, baked beans and crescent rolls. Instead of unrolling the crescent rolls, I sliced the dough into biscuit sized slices then cut them into four pieces. The recipe was great! I will definitely make it again! HI there! Do you think using crescent rolls would work instead of biscuits? I haven’t made this using crescent rolls so it’s tough for me to say 100% if that would work. I’d suggest maybe rolling the hot dogs up in the crescent rolls instead of cutting everything up! In the oven now! Started thinking easy/creative for supper and found your recipe. Can’t wait to see how it turns out. Recipe was easy to follow but hubby bought yellow cheese filled hotdogs. Hmm, so I used mozzarella cheese! This sounds delicious, and like something I can make to go straight to my hubby’s heart through his stomach! Does it freeze well? Hey, Sarah! I hope your husband loves it! You can freeze this for about a month, but I would definitely freeze it as a casserole without the biscuits. Top with the biscuits when you’re ready to make and serve. It was Amazing !! My family went back for seconds ! I plan on making this for my family tonight. I love you Nichole and i guarantee Shawn would have ate this up.